Costume complaints and mixed reviews have apparently put paid to Wonder Woman's return to the screen. 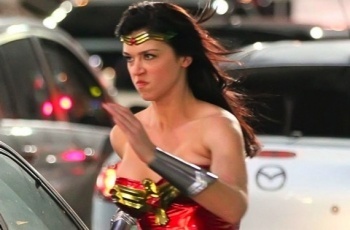 After a hard run race, David E. Kelley's Wonder Woman TV show has sadly fallen at the last hurdle. TV network NBC - the only network that could have afforded to make the show, not to mention the only one that showed any interest - has decided not to pick it up. Kelley's concept for the show was an updated version of the character with Friday Night Lights actress Adrianne Palicki in the lead role. This new Wonder Woman was a successful corporate executive by day, and a vigilante crime fighter by night. NBC hasn't officially said why it turned the show down, but sources suggest that the pilot received mixed reviews during test screenings. There is also the suggestion that the negative response to the costume, which originally included shiny blue spandex pants, played a part. Obviously, this is bad news for the show, and while it doesn't mean that Wonder Woman definitely won't get her own TV show, it does make it a whole lot more unlikely. As the pilot hasn't aired, there's no way to tell if it really was only average, or if it was a misunderstood gem that just didn't resonate with a mainstream audience. In many ways, the former would be preferable, as it would mean that not seeing it wouldn't be so bad.